Catholic teachers and support staff in NSW and ACT schools will vote ‘yes’ to a new enterprise agreement next week, following an 18-month industrial campaign which included two stop work meetings. 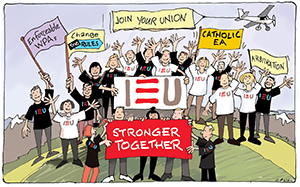 The ‘yes’ vote will bring to an end the protracted dispute between the IEUA NSW/ACT Branch and the 11 Catholic dioceses, with teachers and support staff winning provisions that will benefit themselves and their students. The new enterprise agreement enshrines access to the Fair Work Commission for arbitration, something that was challenged by the employer, and includes work practices agreements which allow teachers and support staff to spend more time with students and less time on data collection and input, meetings and emails. The agreement includes a 2.5% pay rise for 2017, 2018 and 2019 in NSW and in the ACT teachers received 1.5% in April, with an additional pay rise to come in line with public schools. In most dioceses, meeting times are capped to 10 hours per term and there is a commitment to limit unnecessary data processing and programming that is not directly related to teaching. Staff are not required to respond to emails outside of normal school hours. The new work practices agreements also allow for more mentoring and release from face to face teaching for new teachers to address the exodus from the profession in the early years. Support staff will be paid an allowance for attending overnight camps. “It’s a tribute to the determination and unity of our members that they stuck to their guns for 18 months, despite attempts by the employers to bribe them with a pay rise, because they knew how fundamental the right to arbitration was,” Gloria Taylor, Acting Secretary IEUA NSW/ACT Branch said.